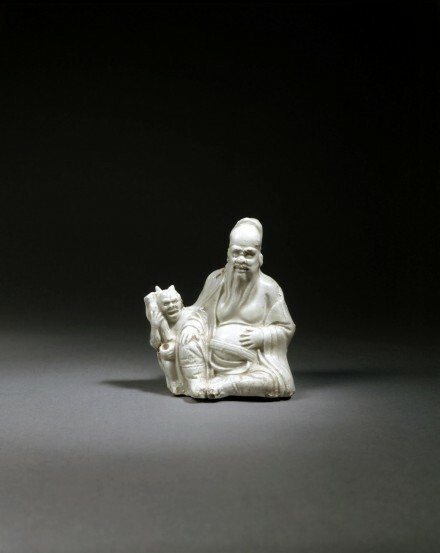 hollow-moulded in the form of a seated figure of Zhongkui, the demon queller, dressed as a court official with long beard, shown seated wearing loose robes over pantaloons and boots, with a close-fitting court headdress on his head and a wide belt across his ample belly, accompanied by a small figure of a subdued demon with two short horns on his head, shown crouching at one side holding a wine cup and a tall slender wine bottle which is pierced through and connected to the hollow center of the figure to serve as the spout of the water vessel, the recessed base with a central aperture to allow for filling, covered all over with a clear glaze of very slightly greenish tint, the base left unglazed revealing the hard, dry porcellaneous body. This ingenious vessel, called a dao guan hu because it is filled through the base, was made as a vessel for the scholar's table, to provide water for mixing ink on an inkstone. Zhongkui first appears as a popular god in the Tang dynasty. According to legend, Zhongkui was a scholar from Zhongnan who came to the capital as a jinshi in the Wude period (A.D. 618-627) to seek the next higher degree, but when corrupt officials falsified the results of his examination and he was denied the degree, he committed suicide by dashing his head against the steps of the imperial palace. When the emperor learned the truth and awarded him the posthumous rank of a court official of the green robe and gave him an honorable burial, Zhongkui vowed to protect the emperor and all his loyal subjects from demons. In the eighth century the Tang emperor Xuanzong had a dream in which Zhongkui appeared and told the emperor of his promise to rid the world of demons. The emperor then commissioned a painting by the court artist Wu Daozi commemorating his dream, showing the demon queller at work. By the early Northern Song dynasty the artists at the Hanlin Academy had developed a custom of presenting Zhongkui paintings to the court on the last day of the year. Zhongkui is still associated with the Dragon Boat Festival and New Year’s festivities in China, and he remains a popular image embodying the wish that the ‘demons’ of bad luck will be kept away during the new year.